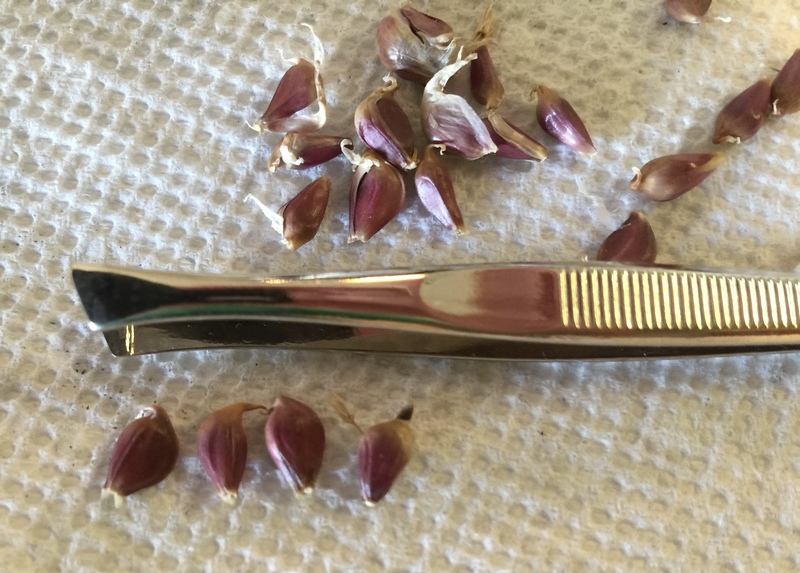 We are not garlic experts by any means, but we wanted to share our current experience. A neighbor gardener gave me a dried mature scape (the remnants of the garlic flower). The mature scape on this variety is like a little cluster of about 75, one quarter inch long miniature garlic cloves. 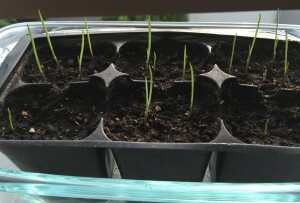 Scape normally only develop on hardneck varieties of garlic, however occasionally an individual softneck plant will grow one. These can be planted to be increased into a future garlic crop. I just takes a year or three longer. 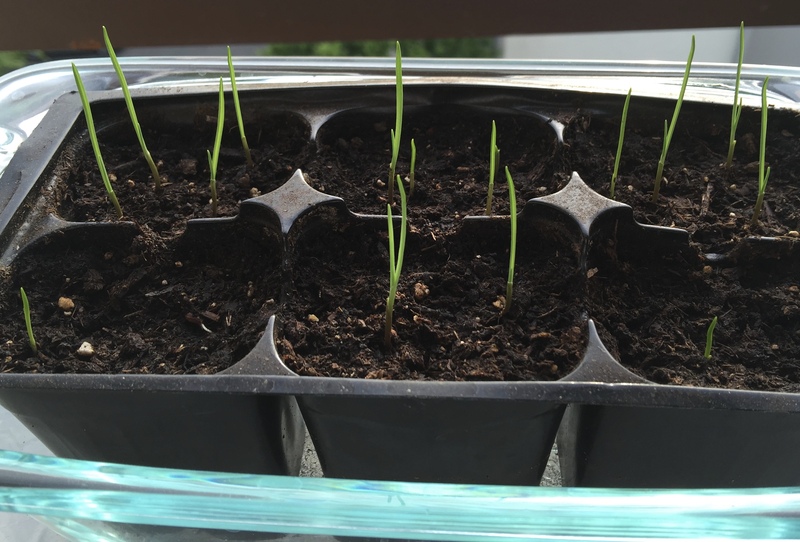 From what we could research these little garlics are called either Bulbils or Bulblets. We are going to refer to them as bulbils. 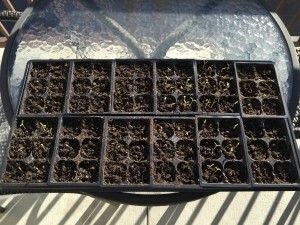 We are going to plant about a third of these bulbils in a potting soil six pack, 4 to a cell, for future transplanting. We will also plant the other 2/3 directly into garden soil. Each bulbil has a rooting end which was attached to the scape and a shoot end which is the very pointed opposite end. When you plant these it probably doesn’t matter which way they are oriented since they are so small but we tried to orient them shoot end up and root end down. Why not save the plant a little energy and point it in the right direction. Who wants to do summersaults buried in the dark ground. We like to use a pair of tweezers for planting seeds and now bulbils in the potting soil. Basically we use the pointed end to make a small depression in which to place the bulbil a little less than a half inch deep. This depth would vary by garlic variety as bulbil size varies by variety. Watering:: You may have noticed the single hole in the bottle top lid our first photo. We attempted to make a dribbler watering bottle with this lid. It did not work because it did not have a vent hole to let the air enter. 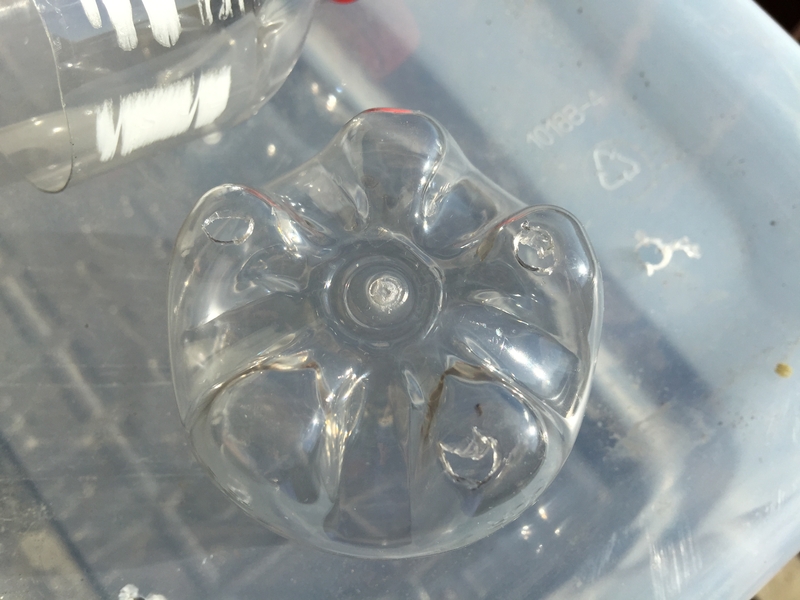 So we re-enginered the bottle top lid to have a large pouring hole and a smaller air vent hole. 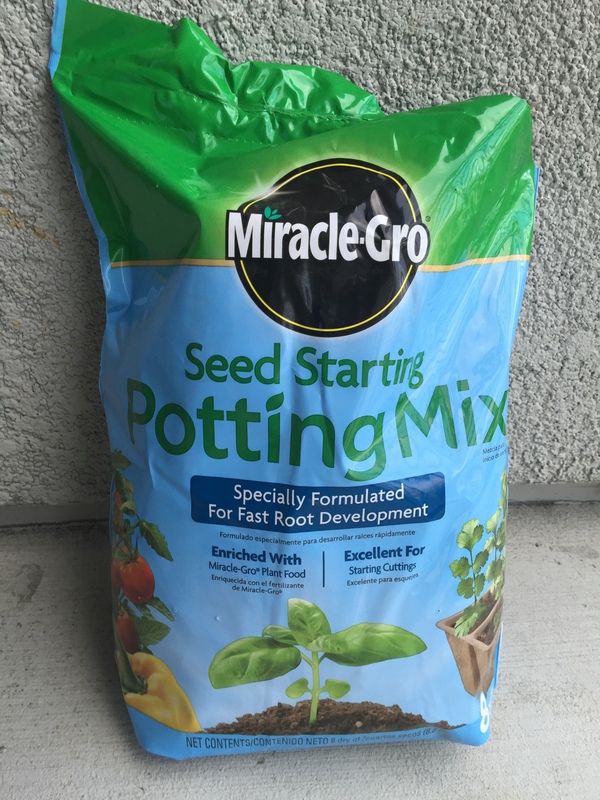 This worked extremely well for watering the potting soil in the six packs. We also added bottom water for the water to absorb through holes in the bottom the six-packs. 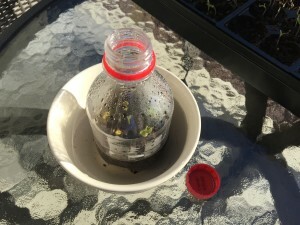 Two holes in the bottle cap for more controlled watering – the small hole lets in air! The bulbil should grow in the first season into a small garlic bulb which may be 1/4″ to one inch in diameter, that is not divided into cloves. The second year you may grow full size bulbs but it may mature in to a cluster of small cloves. 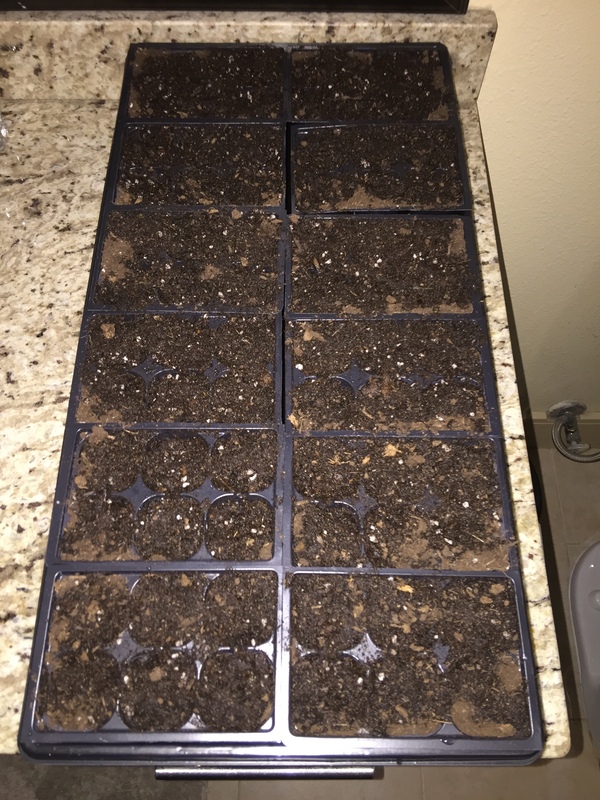 Those cloves can be planted and hopefully mature into full size bulbs in the third year. 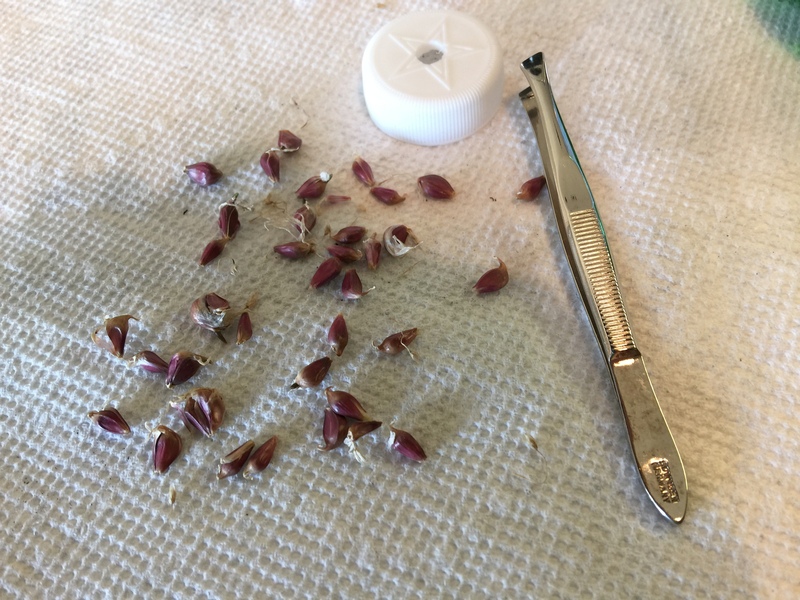 The bulbs and cloves need to be replanted each year in the proper spacing for the size of the bulb or clove. 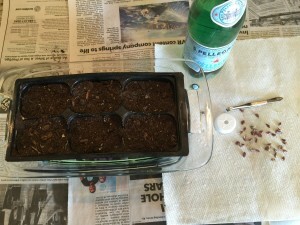 This is a great way to share your garlic with a neighbor gardener or increase your own crop size. Across varieties the whole process can take from 2 to 5 years. Seeds of Change® has the best seed packets!! 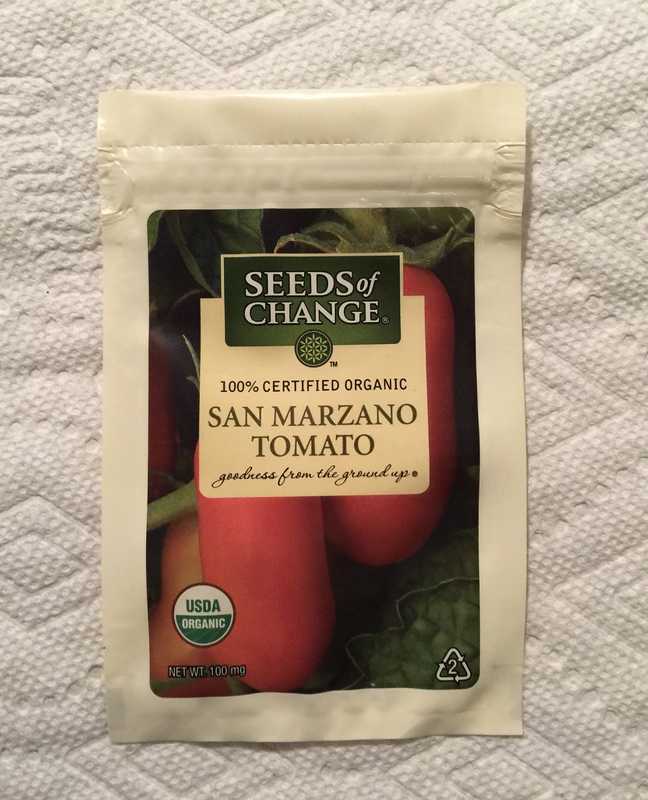 Seeds of Change® brand seeds are offered for sale at our local Home Depot. 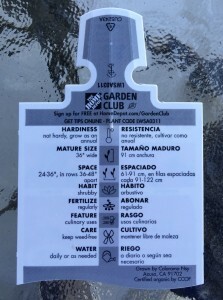 We also receive a catalog in the mail and you can order online at www.seedsofchange.com. This company markets organic seeds. 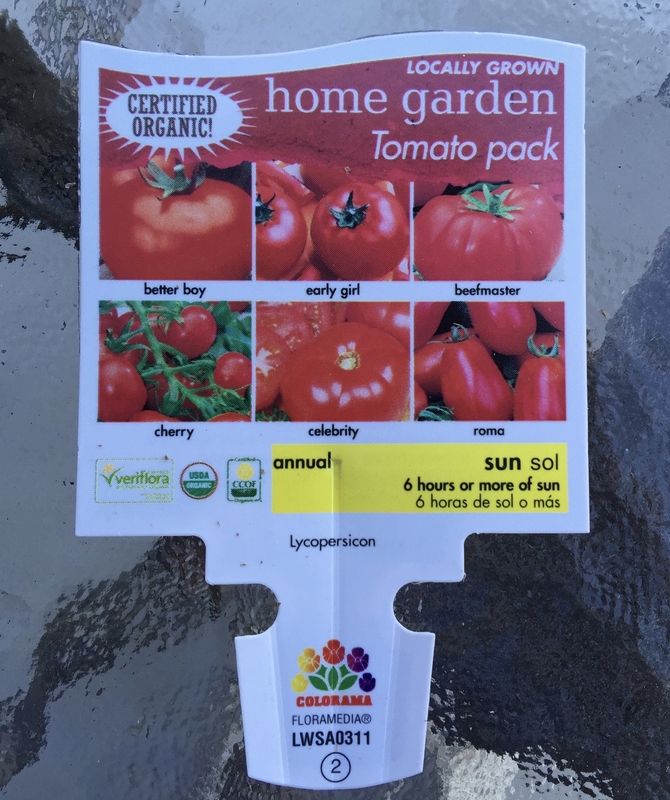 Although we feel the benefits of organic farming are greatly exaggerated, they offer a large variety of seeds for sale and we love their seed packaging. 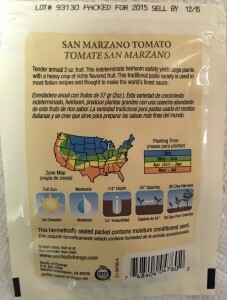 We wish all seed companies packaged their seeds this way. Here is a list of the benefits of we observe in their packaging. 1) Made of moisture proof plastic. If you get water on it the ink doesn’t run, the paper doesn’t get wet and the seeds stay dry. 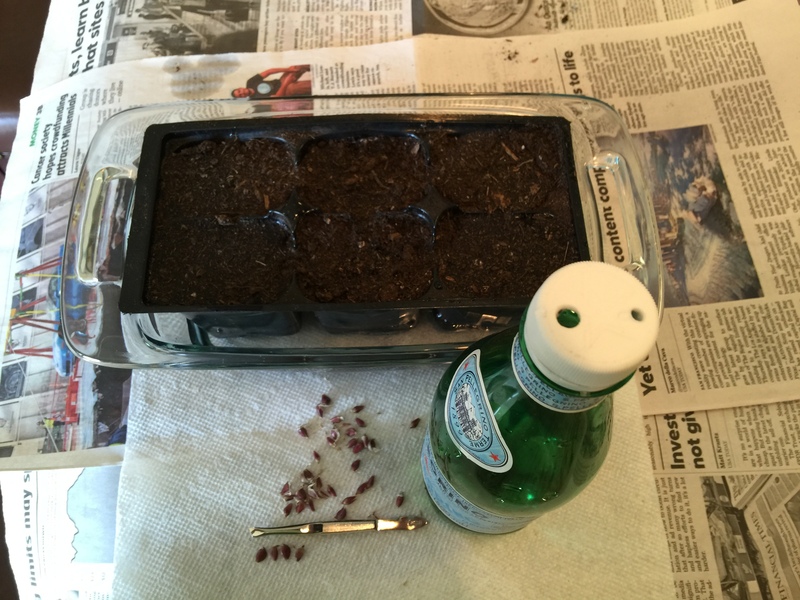 2) Resealable so seeds are not lost unintentionally as long as the package has been resealed. 3) Easy to open with the simple tear-off strip. 4) The back of the package is bilingual and provides a graphic display to help gardeners who speak other languages. 6) Great color photo graphs and print. The tear-off is removed easily! 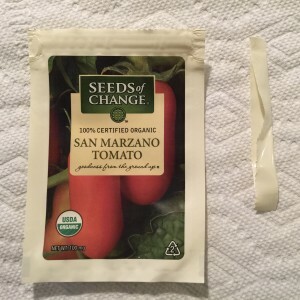 The seed packets cost more than some seed companies and less than others. We would expect to pay more for the organic seed which is justified and a premium for the superior packaging. The packaging is value added and we appreciate the extra effort to keep the seed viable even after the package has been opened. We often keep left over seed from year to year and this packaging helps preserve the germination potential. Tomato Six Variety Six Pack – A great way to buy tomato plants! We made a little discovery that we wanted to share. At Home Depot, they are selling a 6 pack of organic tomato plants that contains six different tomato varieties for $4.48. It is a nice mix of early, late, cherry and roma plants. I can’t grow the seedlings myself for that little amount of money! Most years we want to plant about 6 tomato plants with several varieties, and end up buying a combination of single pots and six pacts of single varieties to get what we want. Then we have to give away or throw away the ones we don’t have room to plant. 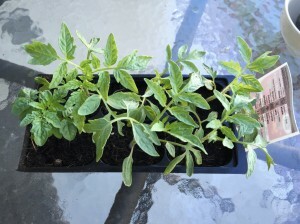 Although we might not pick the exact mix of plants available in this specific six pack, the variety choices and types of tomatoes offered are very good and will cover most back yard garden needs. We still may add a couple more varieties to our garden, but this is great start. Determinate tomatoes are a bush type tomato (2-4 ft) that you do not prune or stake. You can grow them in a short cage to help support the fruit. 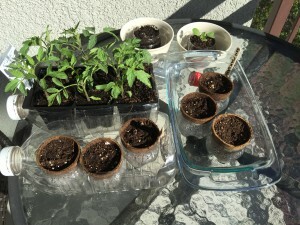 You can also grow them on plastic or with fabric underneath to keep the tomatoes off the ground. The plant generally sets all the fruit about the same time (about 2 weeks) and stops producing fruit when the top bud is pollinated. Commercial canning varieties are produced this way so they can be hand harvested, or mechanically harvested, all at once at the peak of ripeness. Indeterminate tomatoes continue to grow throughout their life and can reach 12 feet tall or trained to grow laterally. They can easily reach 6 feet in height. These varieties require support, with a stake, cage or trellis. 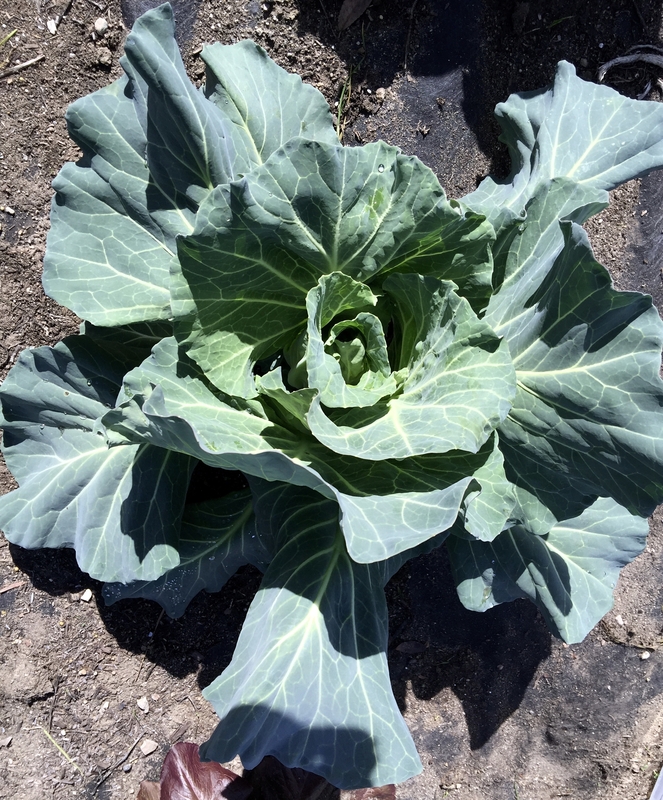 They will continue to grow throughout the summer. Larger fruit and more consistent fruit production will occur if the plants are properly pruned. Once the plants start blooming, the plants will continue to bloom, set fruit, and fruit can be harvested all at the same time. 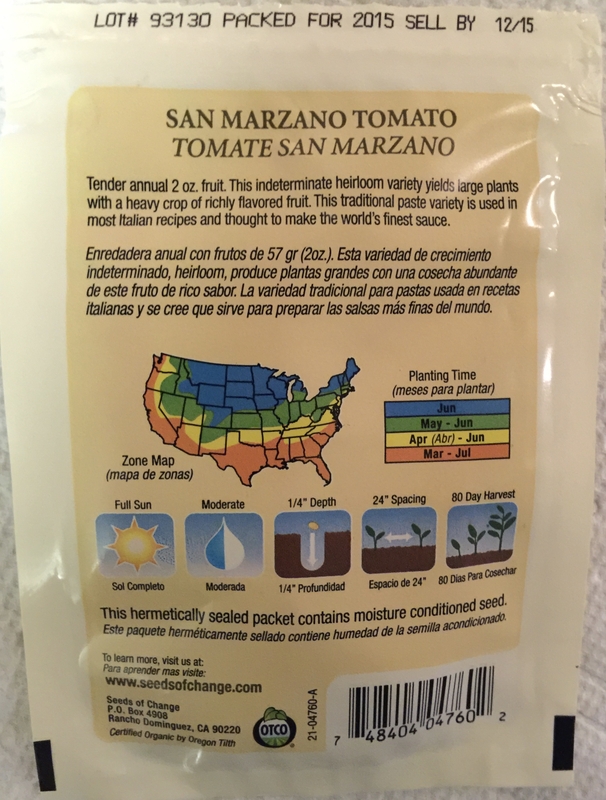 When daytime temperatures are below 85 and above 70 tomatoes should set fruit consistently. When temperatures are consistently 90 or above, the blossoms may not set and fruit production can be limited. 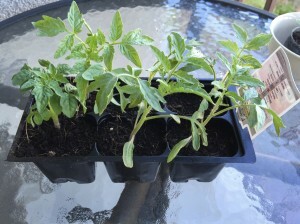 All tomato plants will die with a killing frost, although a few varieties seem to be a little more resistant than others. At the current time we only have a few honey bee hives and we do not have enough volume to use our large honey extractor. When we extract the honey from only a few shallow supers, we use the old antique honey extractor that we bought second hand over 30 years ago. This extractor is easy to operate and easy to clean. 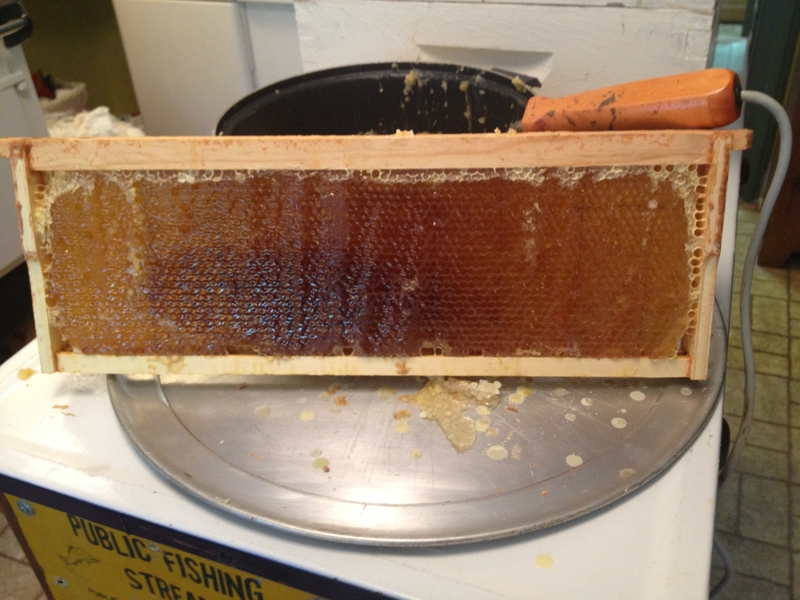 We are fortunate to have some beautiful fresh honeycomb to extract. 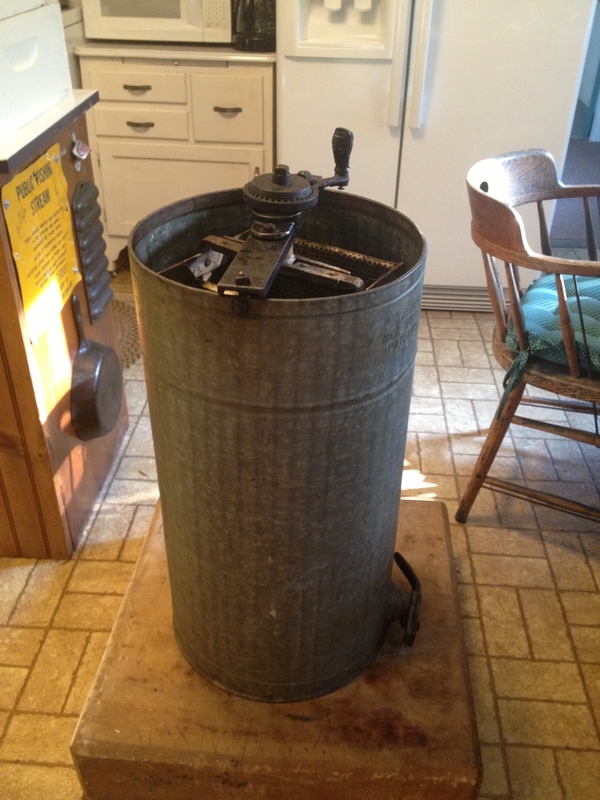 The extractor is a basically a round tub with a drain and a hand crank. The crank turns a mechanism that holds two frames of honey at a time. Once one side of the frame is extracted, the frame is reversed and the other side is extracted. The honey flows outside of the frames by centrifugal force. Once it hits the side of the tub, it gradually flows to the bottom of the extractor. After extracting several frames, the honey is drained from the bottom of the extractor. 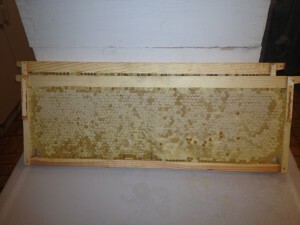 The honey bees seal the wax honey cells with a cap once they are filled and the honey is ready to be sealed. The honeybees use their wings to create ventilation in the hive to remove excess water from the flower nectar, from which the honey is made. 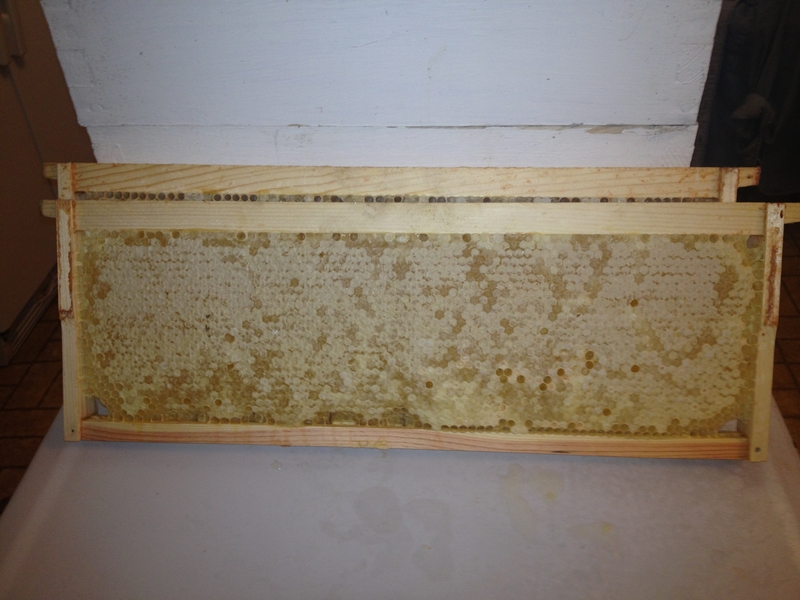 Once the sugar content of the honey is the proper concentration, the cells are sealed. Prior to extraction, the caps need to be removed. To do his we use an electric hot knife which cuts and melts the caps at the same time. The removed wax caps are saved to use later to make candles. Once both sides of a frame have had its caps removed, it is immediately placed in the extractor. When two frames are ready for extraction, the extracting process can begin. You need to have two frames in the extractor for proper balance. 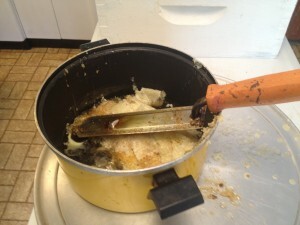 An evenly balanced extractor will have less vibration and the honey will be easier to extract. After the honey has been extracted it can be stored in large plastic five gallon storage containers. A spigot can be attached to the container for bottling. When the honey is initially extracted it will contain a variety of natural impurities which originate from the original frame. The impurities in the honey include, wax pieces, and propolis. Propolis is a “glue” secreted by the honeybees to fill spaces in the hive. 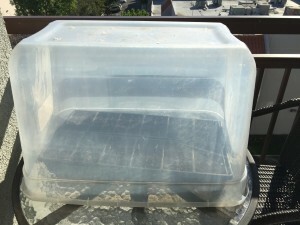 If you let the storage container set for a few days the impurities will rise to the top. The honey is heavier than the impurities. 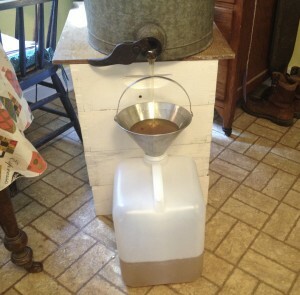 This allows the pure raw honey to be dispensed from the bottom of the container for bottling. In mid October in north GA we were removing our summer flower beds and replanting pansies for the winter. 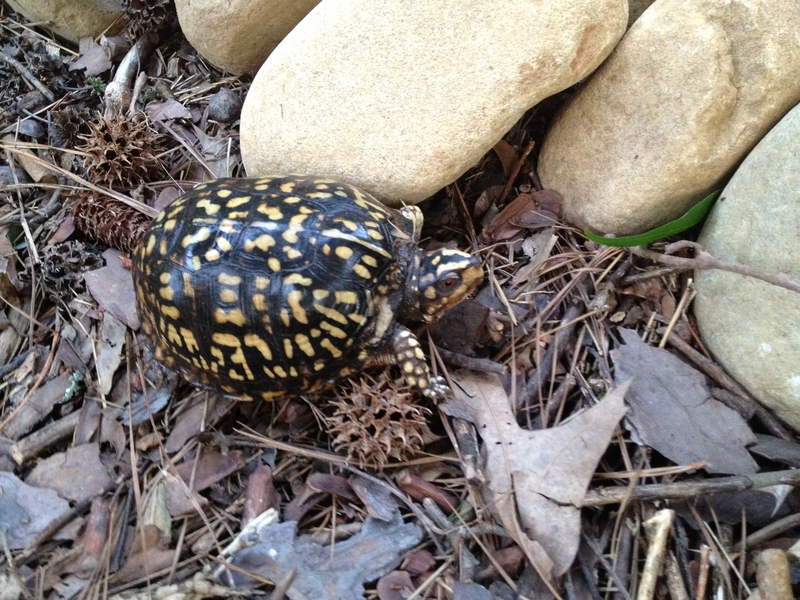 When walking through the yard our eye caught a newly hatched Eastern Box Turtle (Terrapene Carolina, Linnaeus). 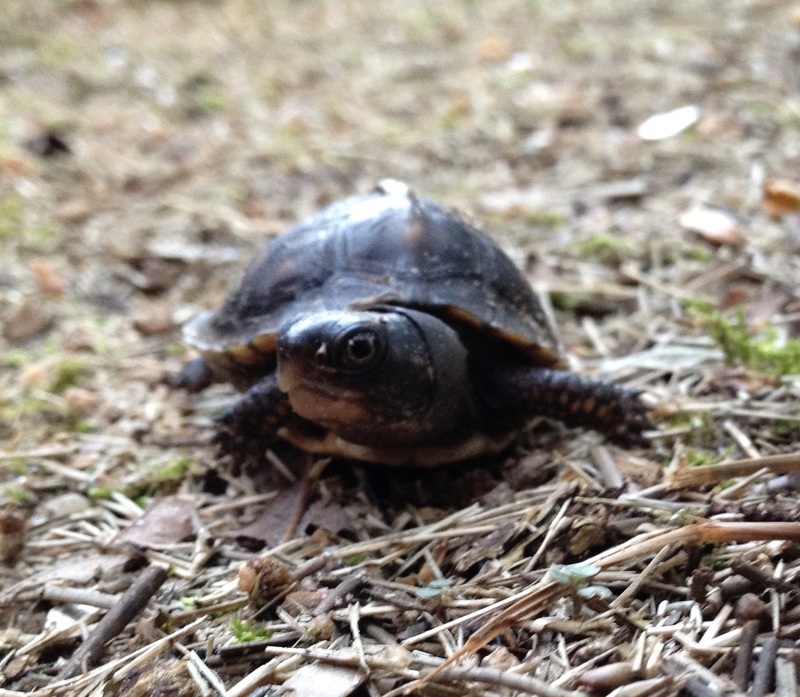 We see mature box turtles regularly in the yard so finding the hatchling was not surprising, although we had never seen one before. 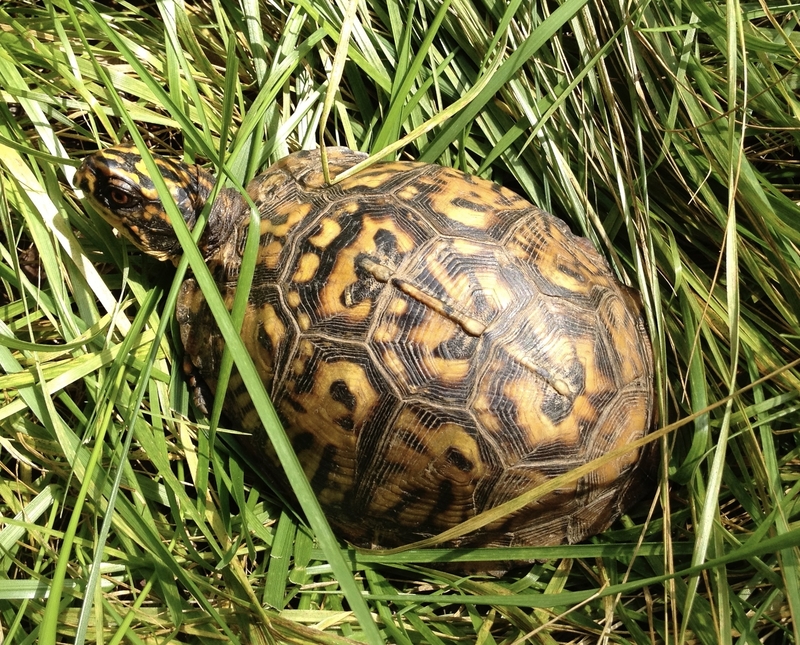 Box turtles will mate in the spring shortly after emerging from hibernation. The females lay eggs in a chamber they make in the soil in June or July. 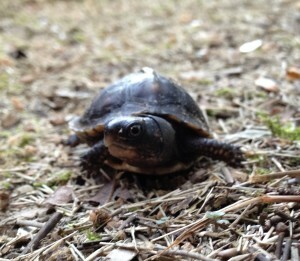 Hatchlings will emerge in 70 to 90 days depending on the weather. Since turtles are cold blooded, the eggs will have a tendency to emerge earlier in warmer weather with sufficient moisture to keep the soil soft. 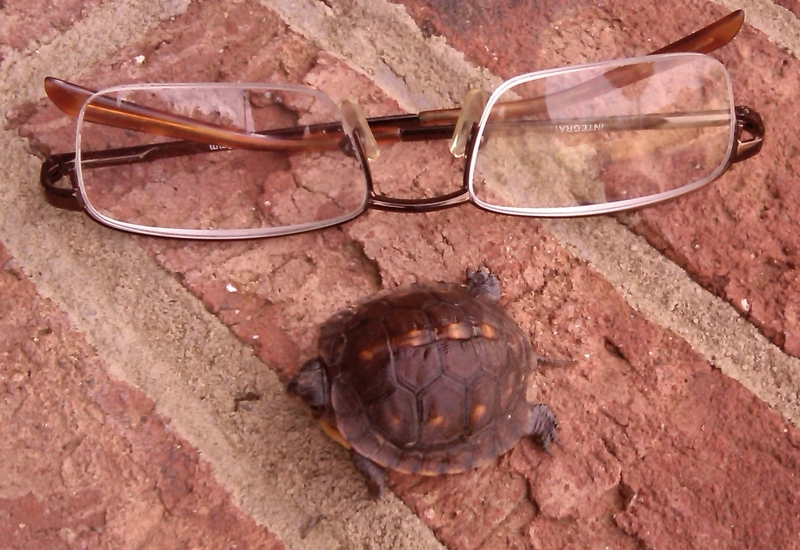 In our case we found this hatchling within a few weeks of hatching. Since harsh winter weather is sometimes fatal to hatchlings, we decided to keep the turtle over the winter for spring release. After a little research we determined that feeding the hatchling meal worms would work best. Meal worms can be purchased at a local pet specialty store. 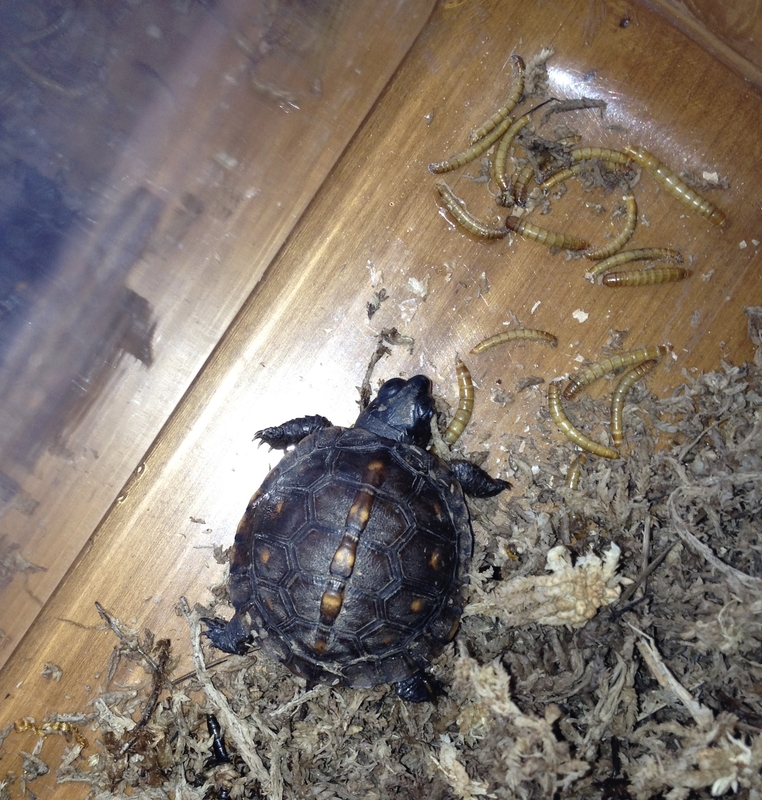 The meal worms stay alive for several weeks if kept in the refrigerator and the turtle seemed anxious to eat them. Although mature box turtles are omnivorous, eating both plant and animal flesh, the hatchling are carnivores. Throughout the winter months we observed the turtle eating well and growing well. As spring approached we decided to set it free. 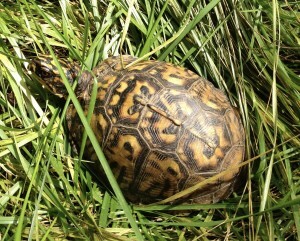 In early April on a nice warm sunny day we placed the hatchling on the ground not far from when we originally found it. It sat still for so long I became tired of watching it and I became distracted by something else in the yard. When I returned a few minutes later, it was no where to be seen. Certainly it had scurried under the nearby dead leaves in the woods just a few feet away. The Eastern Box Turtle has several color and shape phases. 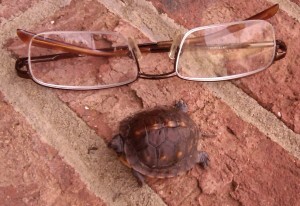 We observed both the box turtles pictured within our neighborhood. We often see evidence of their visits to our vegetable garden where they feed on low hanging tomatoes. 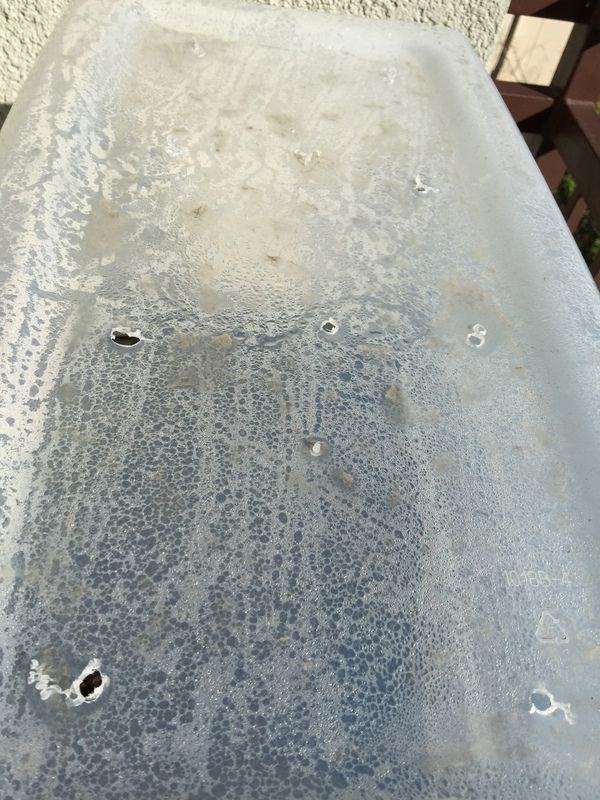 You can tell by the bite marks that it is not a squirrel or some other animal. 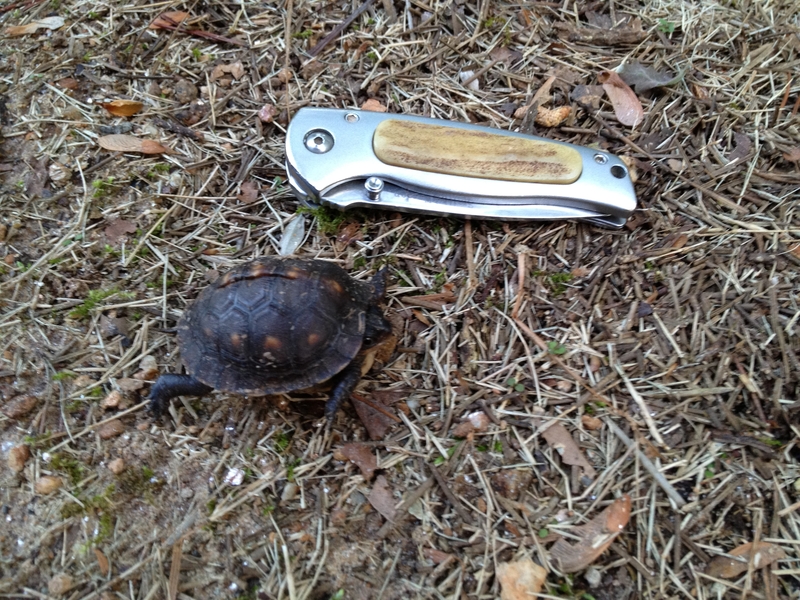 Although these box turtles look quite different in their appearance, this is quite normal for Eastern Box turtles. They are a welcome sight in our yard. We mainly see them in the spring or early summer before the hot months of July and August, and then again in early autumn as the temperatures cool down. 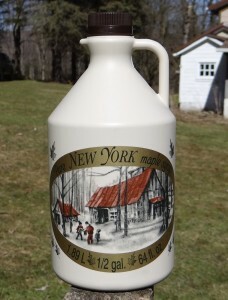 New York State Maple Syrup! Every year late February and March is maple syrup season in western NY state. A couple years ago I visited my friends, the Pixleys, who have been making maple syrup for more than 60 years. 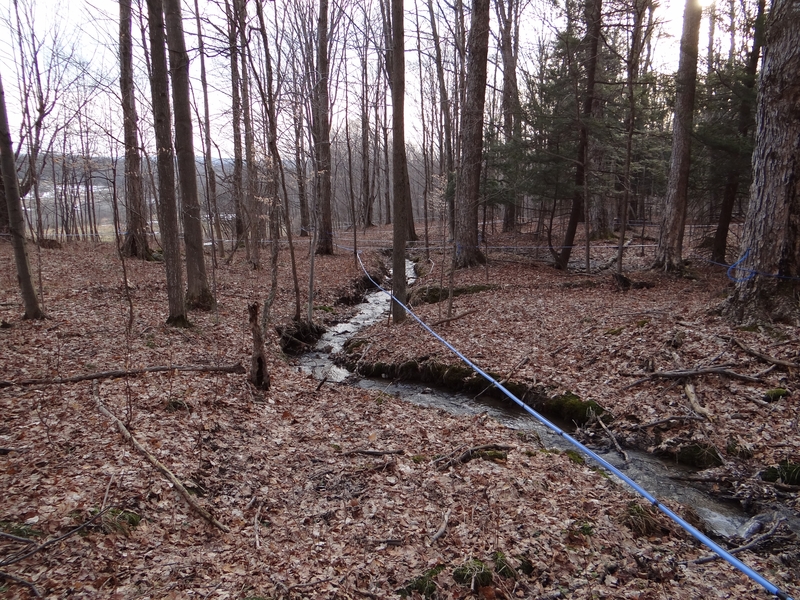 The process starts in mid February or early March tapping the maple trees and maintaining their tubing system for the upcoming maple syrup season. The number of taps in a single tree is determined by the size and health of the maple tree. A very large tree may have 3 taps in the same tree. Smaller trees may only have one tap and other immature trees in the forest will have none. The sap runs best when the daytime temperature gets into the upper 40′s or low 50′s and the night time temperatures dive into the mid 20′s. 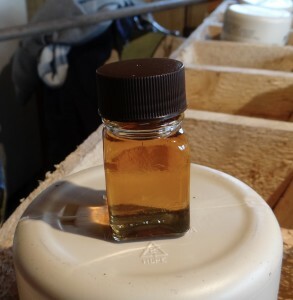 At the beginning and middle of he maple syrup season the sap will run clear. At the end of the season it will start to turn more yellow signaling the end. 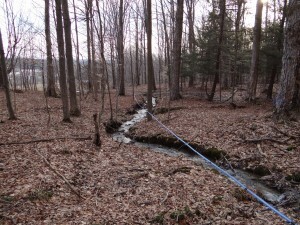 The trees are tapped and connected to a network of tubing that collects maple sap from groups of trees. 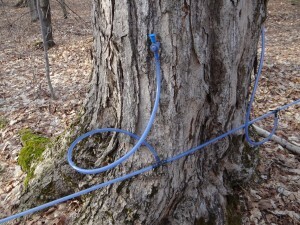 As the sap from more groups of trees are joined into the main flow, the size of the tubing is increased. 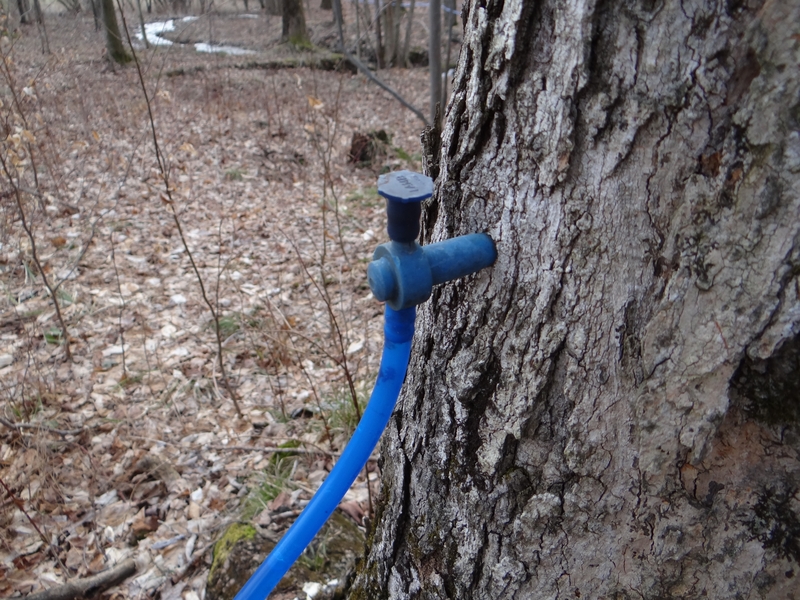 The tubing system is used when the maple trees grow on a hillside and the flow of sap can be directed downhill towards a collection point. At the collection point it flow into a stainless collection tank. 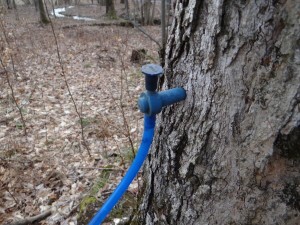 Another system is to put metal taps into the trees and hang buckets which collect the sap. The maple tree forest and the building where the syrup is made is called a Sugarbush. A large sugarbush will have more than one collection point for the sap. 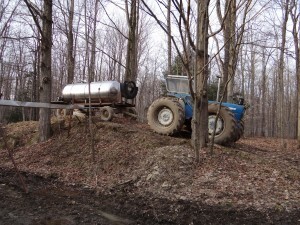 A tractor and portable stainless steel tank is used to transport the sap from the collection points back to the Sugarbush building where the fresh sap is made into maple syrup. 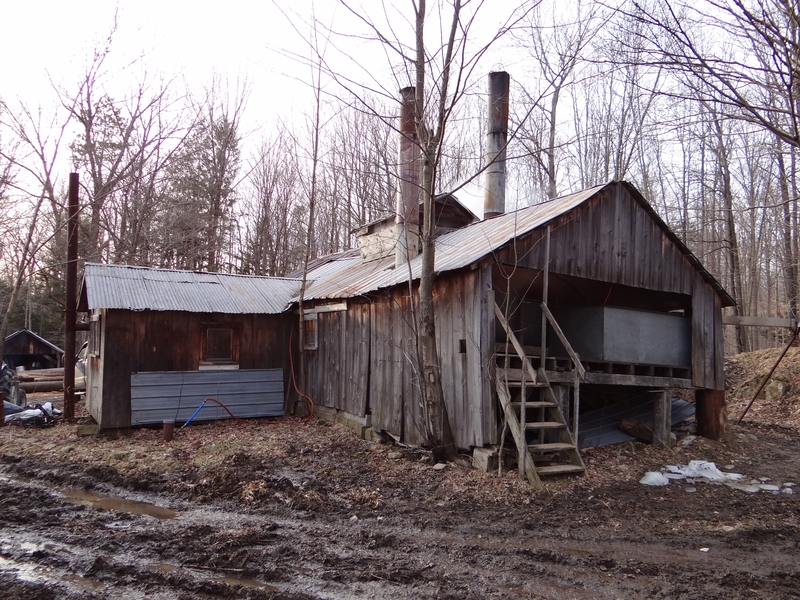 This Sugarbush building contains two large wood fired evaporators, tank storage for the sap waiting to be boiled, a large woodshed to store firewood, and a kitchen. The roof of the building has two large smokestacks for the wood smoke to exit and one large vent opening for the steam to exit the building. The sap is gravity fed into the far end of the evaporator. The evaporator is basically a large flat pan with compartments. As the water is boiled away from the sap the resulting liquid is higher in sugar content as it gradually flows from the far end of the evaporator to the near end of the evaporator. 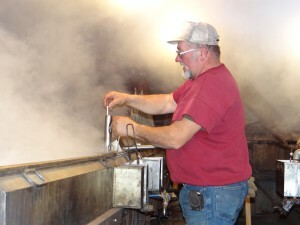 The sap with the highest concentration of sugar eventually flows to a mall area where the finished syrup is drawn off. 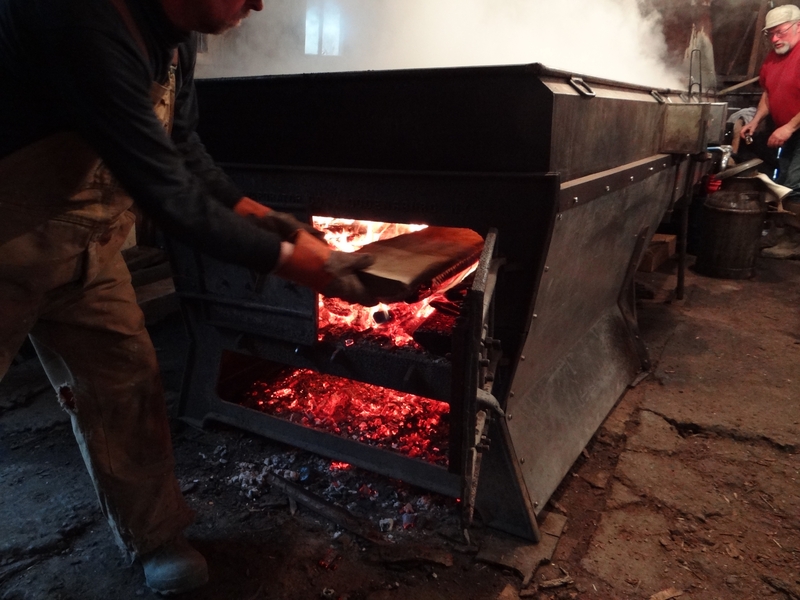 It is necessary to have a very hot wood fire under this evaporator to make the sap boil over the entire length of the evaporator. It takes a really hot fire!! 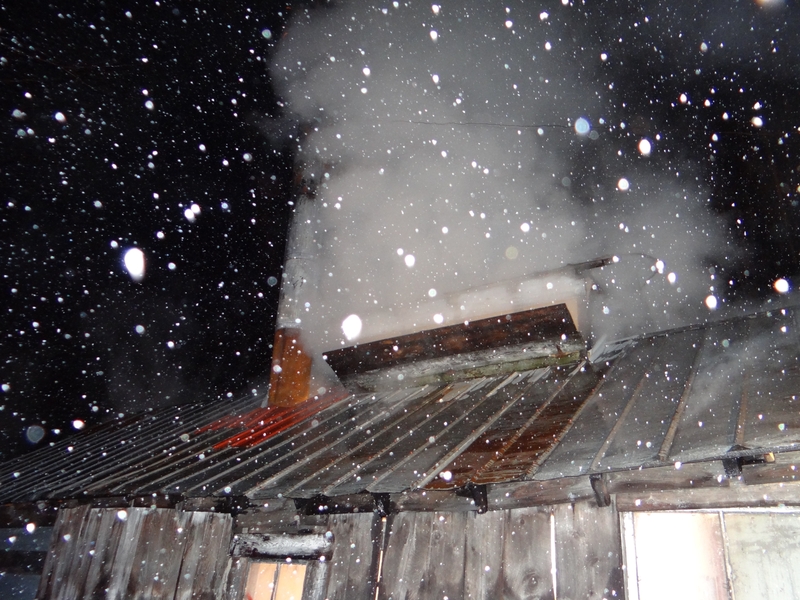 The hot fire combined with the boiling sap make the building very hot and humid. It takes a special type of person to be successful at this enterprise. When the sap is running freely from the trees it becomes almost a 24 hour a day job to collect the sap and boil it into syrup. The outside conditions are often cold, wet, snowy, icy, windy and muddy. The inside conditions are extremely warm. When enough water has been evaporated from the sap it is determined to be syrup with the use of a hydrometer. This instrument measures the specific gravity of the syrup. The specific gravity is related to the sugar concentration. Too thick or too thin is not acceptable. A person with a lot of training and experience is required to do this. Making maple syrup is part art and part science. Once the syrup is ready, it is drawn off in small batches, filtered and then poured into stainless steel drums. When the season is over the local producers will gather to sell the syrup to wholesale buyers. Most producers also keep and sell smaller quantities to friends, neighbors and other interested parties. The syrup is also sold locally in gas stations, restaurants, roadside stands, and at producers homes. Some producers have their own website for retail sales. A sample is taken regularly and taste tested to maintain quality control. Changes in the weather and changes as the season goes from start to finish can influence the flavor and color of the syrup. Maple syrup has different grades depending on color and flavor. 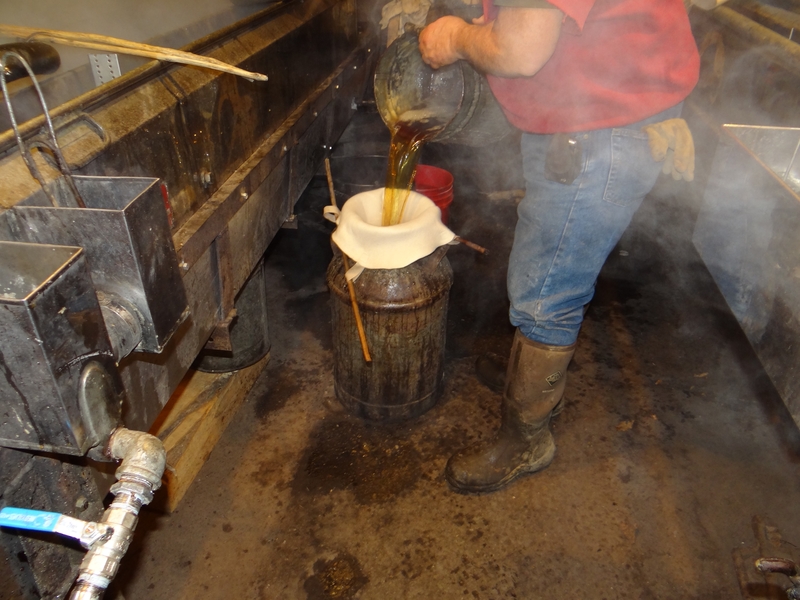 Each drum of maple syrup is graded so that it can be sold meeting specific criteria. Different grades are preferred depending on how the maple syrup will be used. Higher grades are often eaten fresh from a bottle or jug and lower grades may be blended with other sweeteners or products. Quality Control – The taste test bottle!! 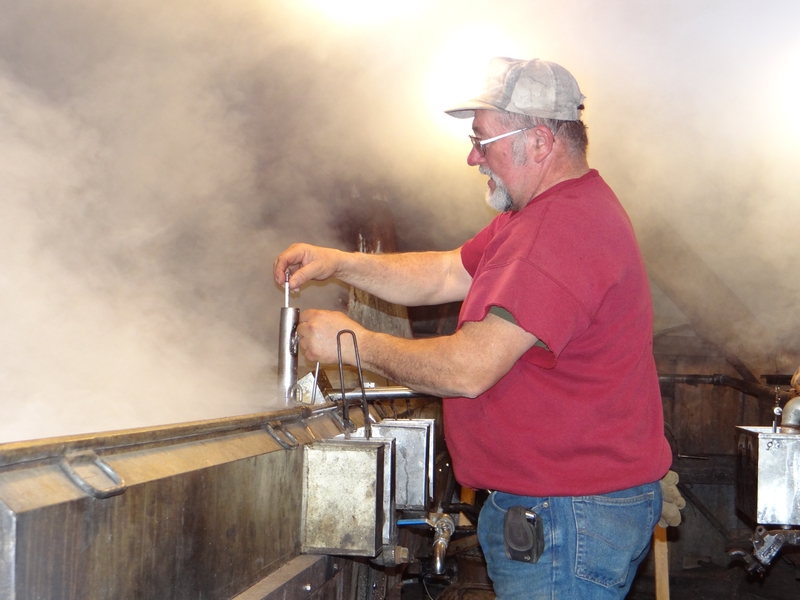 There is a special feeling of hard work and accomplishment after a day of making maple syrup. When working late into the evening on a cold snowy night, one pauses to walk outside to cool down from the immense heat of the building. To look up at the glow of the smokestacks and evaporator and see the big snow flakes coming down is almost magical. Other nights you may be looking up into a night sky full of stars far away from the city lights. 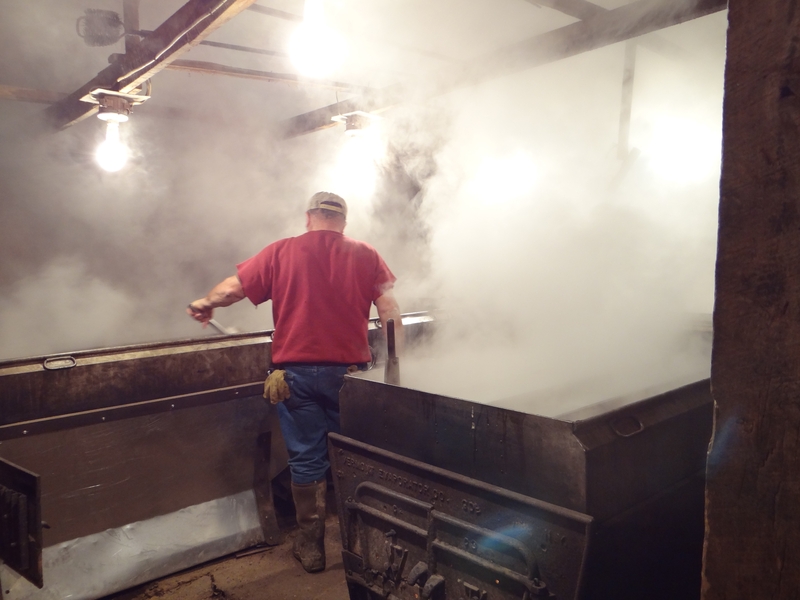 Making maple syrup on a cold snowy March night! A simple and inexpensive way to start a seedling or two is to use a small coke bottle to make a miniature greenhouse. This can be done with other plastic containers as well. We picked this bottle type because it narrows in the middle. 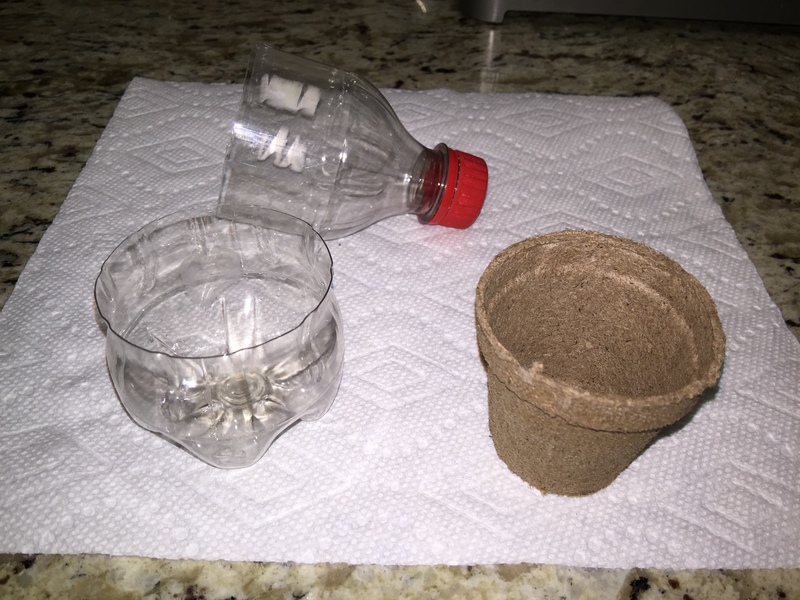 The middle can then be cut away and the top portion of the bottle will fit over the bottom portion, creating a removable “greenhouse” lid. It is important that the seedling can be easily removed once mature enough for transplanting outside. 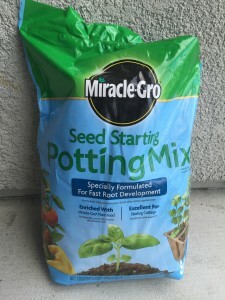 Using jiffy pellets, a small peat pot or containing the potting mix in a newspaper shell are obvious options. 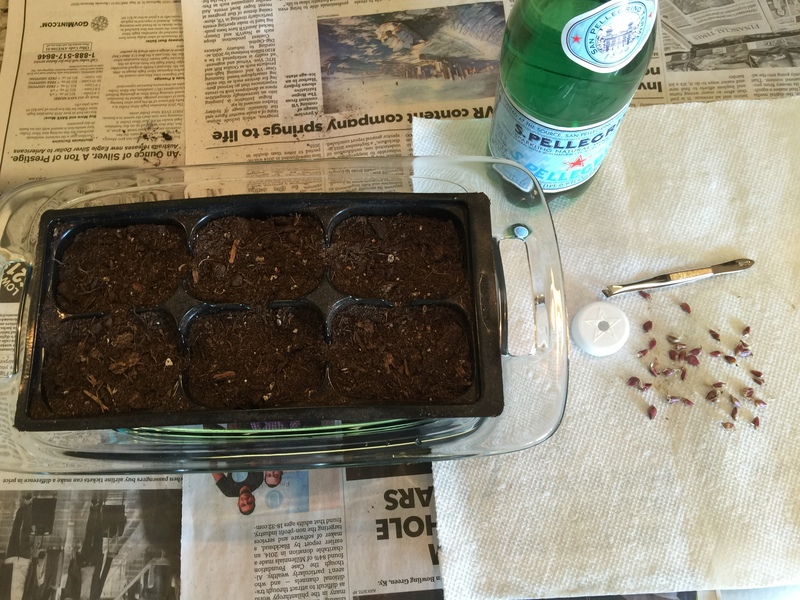 Once the seeds are planted in the potting soil, it will take a few days for them to germinate. 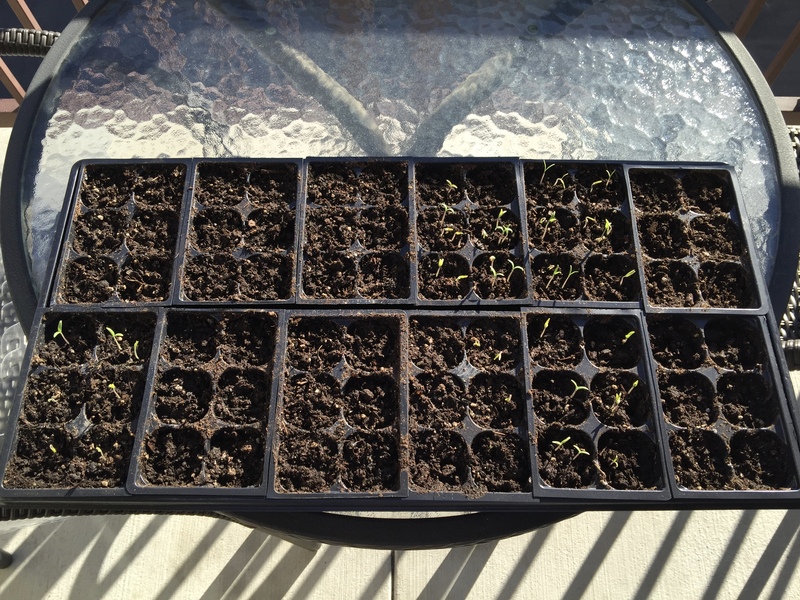 We usually plant a few more seeds than required to make sure we have successful germination. Once the seeds germinate they can be thinned to meet your requirements. It is important to cut small drainage holes in the bottom of the bottle. 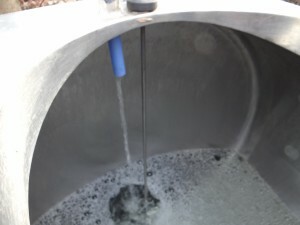 This allows excess water to be removed and air to become available to the roots. For ventilation, a small hole in the bottle cap will help or the entire top half of the lid can be removed or the bottle cap, . Ventilation is required as the temperature and the amount of sunlight increases. 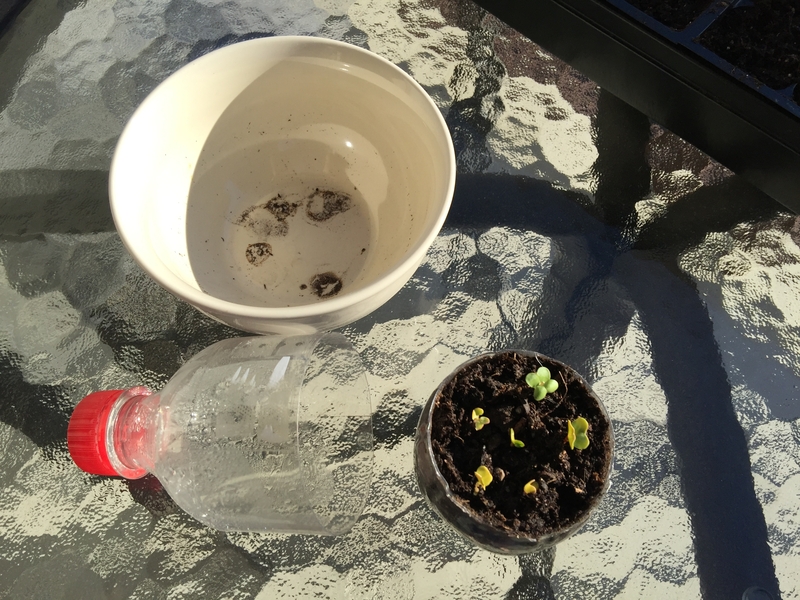 If too much heat develops in the bottle, it can kill or injure the seedlings. Moisture needs to be added as required for germination and continued growth. After germination it is a good practice to let the potting soil dry a little between waterings, but you never want the seedling to be dry enough to wilt. 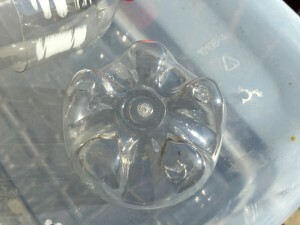 The hole added to the top of the bottle cap and also the drainage holes can be made with several tool choices. We used the reamer/punch on a Swiss Army Knife. A drill bit could also be used. 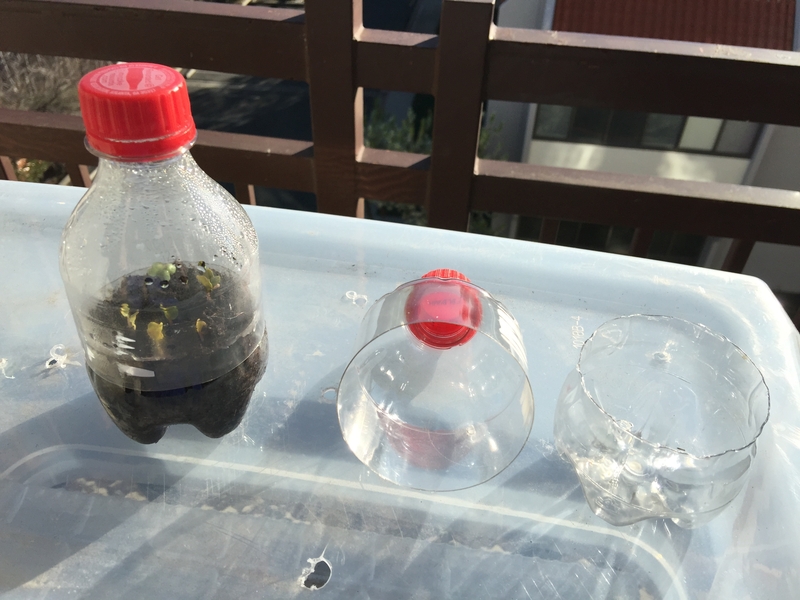 We decided to try 2″ Jiffy® pots to see if they would fit into the bottom of the small coke bottles. 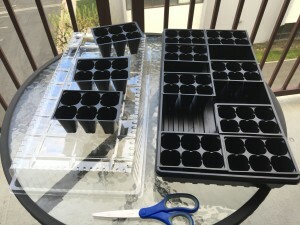 They fit perfectly and will make it easy to remove the mature transplant for planting. Since each Coke bottle bottom has drain holes, we needed an inexpensive container to hold the planter. We used a large fruit juice container (64 oz.?) We cut out the side and left the cap on. 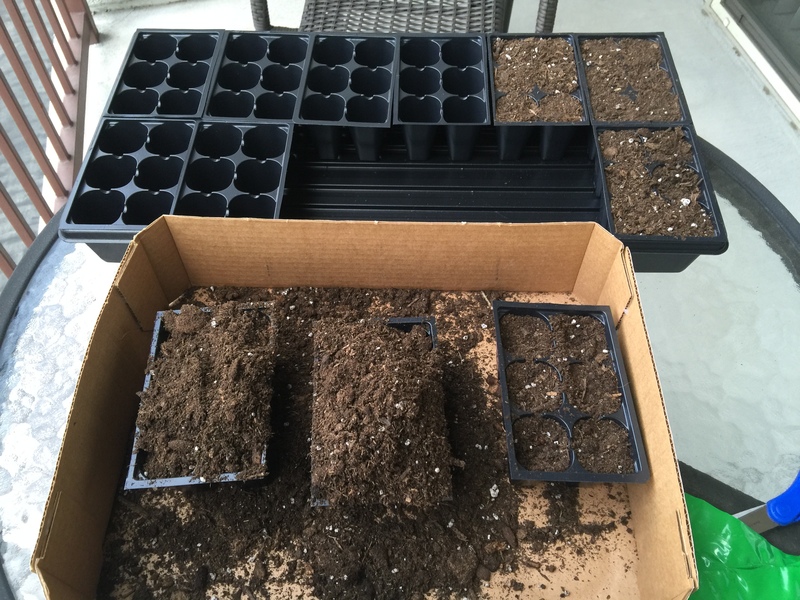 I worked great for holding 3 planters. 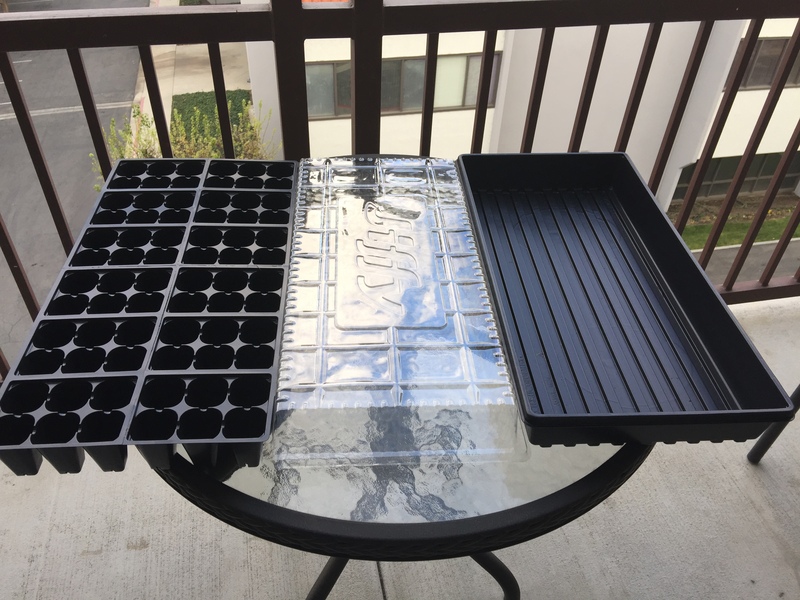 We also found that the juice bottle containers will fit well with some six pack seedling containers if you need to hold your seedlings for a few days before planting. 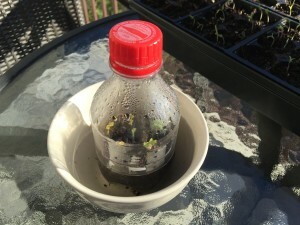 The Coke bottle tops are working well acting as a mini-treehouse, and for ventilation at the same time. 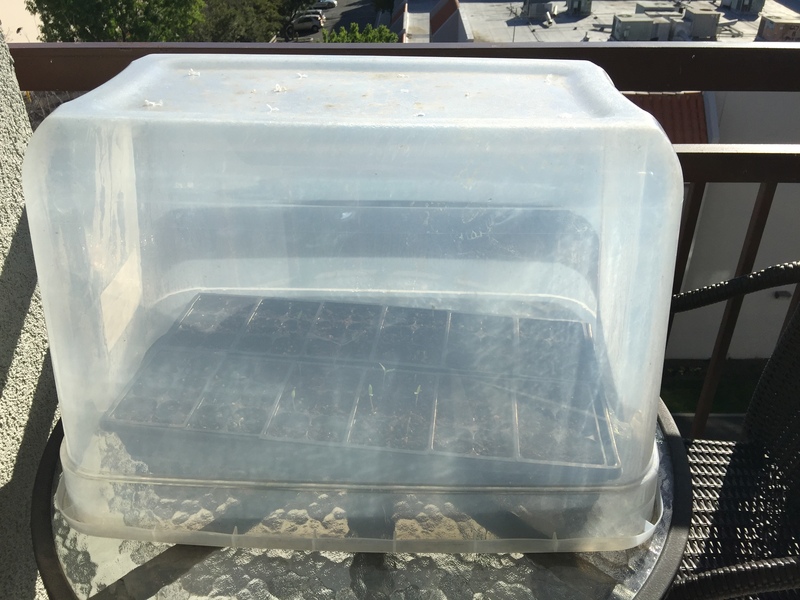 They hold the humidity near the seedling and also let heat escape. We use the caps with the small hole when the weather turns cold for a few days. 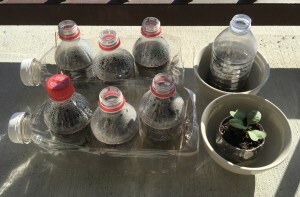 We really like the results we have achieved from the Coke Bottle mini greenhouses. 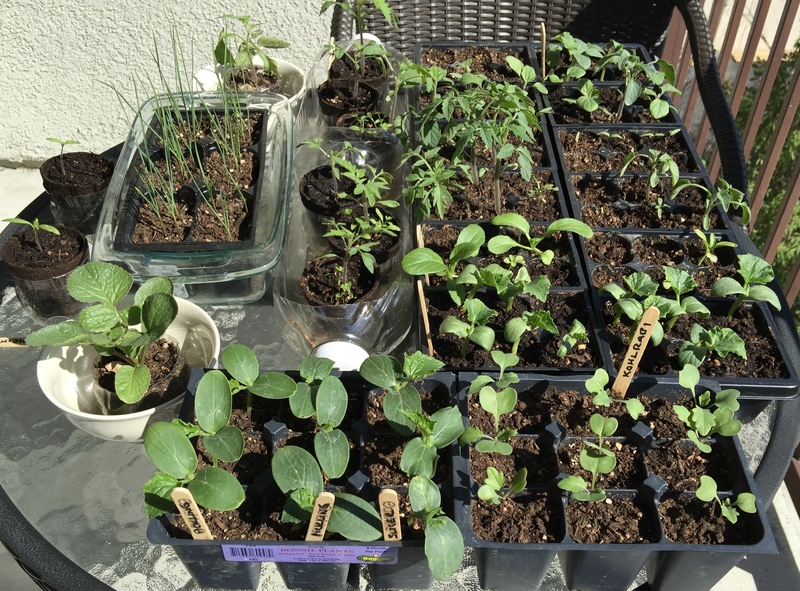 Our transplants are almost ready to be transplanted into the garden. 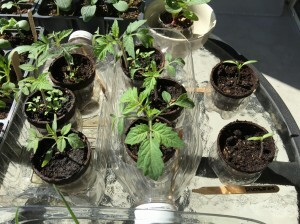 It appears they will be easy to transplant with very little damage to the seedling in the process. 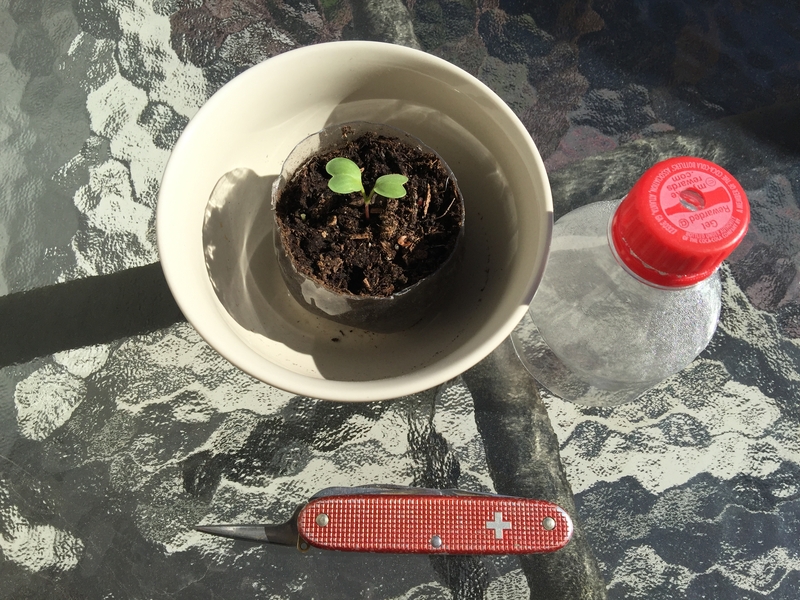 We have come to prefer this method of raising the transplants vs. other methods. 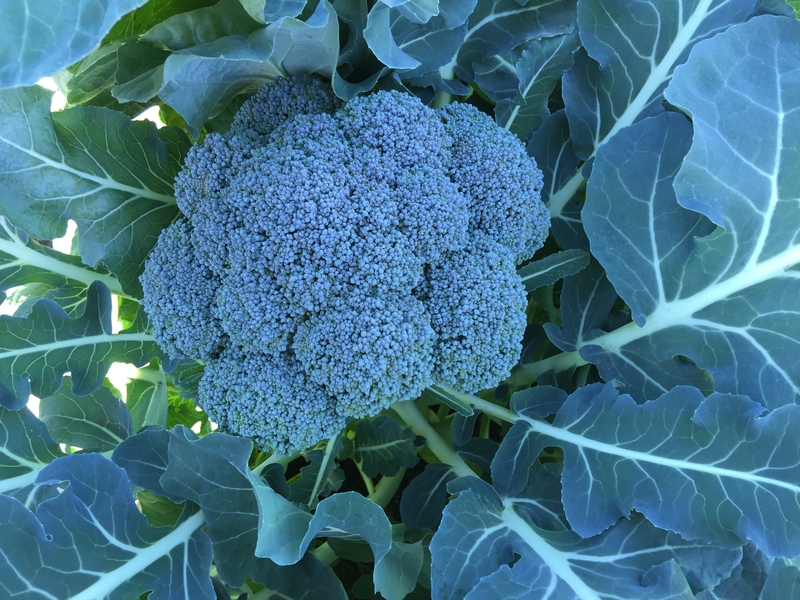 We grew some beautiful broccoli heads in the Community Garden near Los Angeles, CA this winter. We ate some, gave some away and still had more than we could eat. So we decided to freeze about half a dozen heads including some side shoots that developed. Freezing is a way to preserve fresh vegetables and fruits at home. For most families this will be done in small batches. 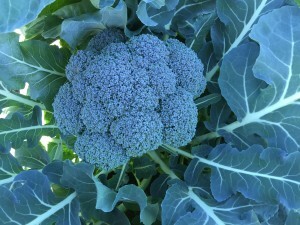 Fresh frozen vegetables many times result in a higher quality product than what you can buy in the grocery store. Before we go into our project, here are some freezing basics to understand. Packaging: Clean, plastic bags or re-sealable plastic containers are preferred. Preparing the vegetables: Pick the vegetables when it is cool, if possible. Wash the vegetables thoroughly in cold water, gently moving them up and down and sideways to dislodge any soil or other foreign particles. Cut the vegetables into the size pieces that you intend to package and preserve. Blanching: Vegetables are living things. 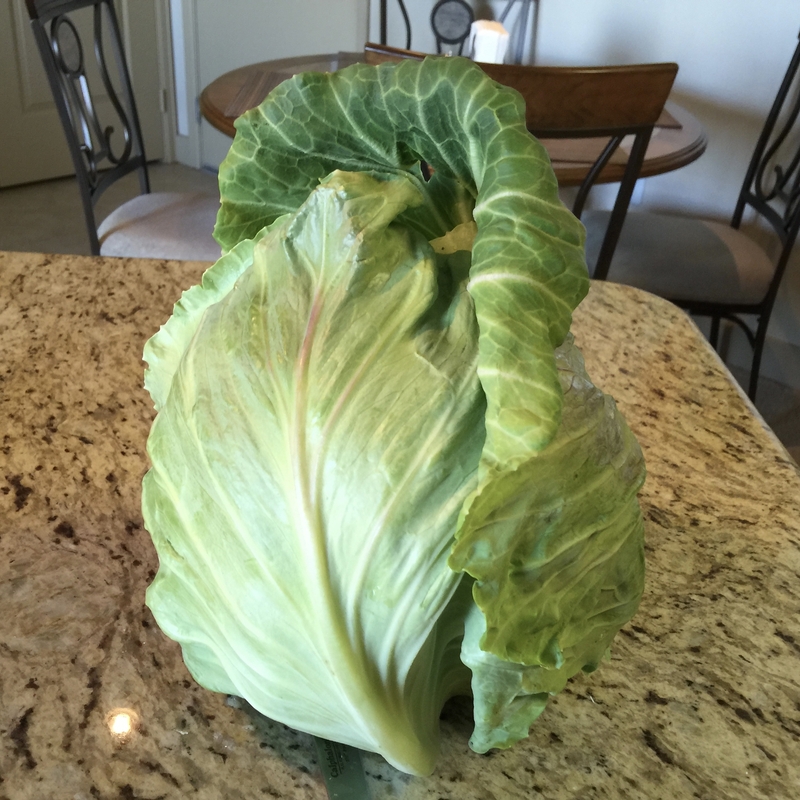 There is a ripening processes going on in the vegetables that is controlled by enzymes. By raising the temperature of the vegetable pieces for a short time these enzymes are inactivated and stop the ripening process. This action prevents loss of color, flavor and texture. Each vegetable has a specific blanching time in boiling water to stop the enzyme activity. The blanching times can easily be looked up in a freezing/canning publication, in a book or on the internet. Many state agricultural extension publications about freezing and canning also feature this information. 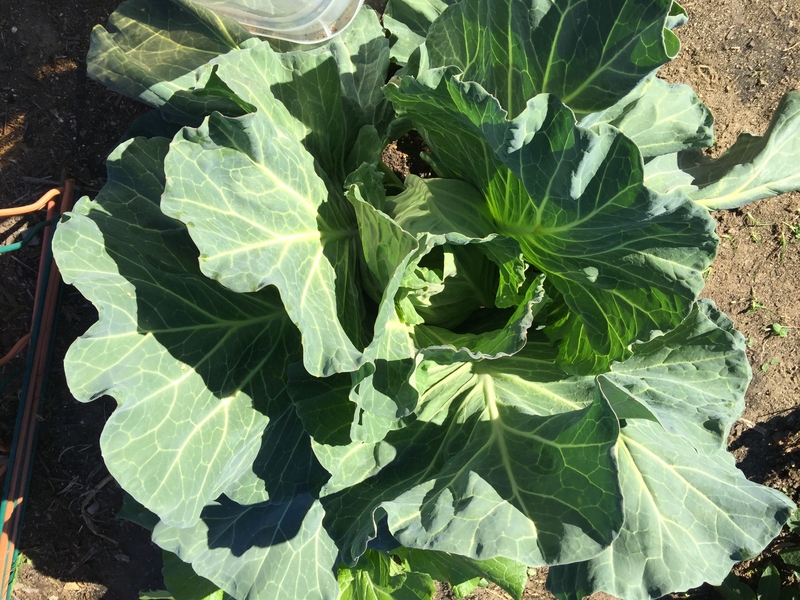 Under blanching is worse than no blanching, so take a minute to look up the proper blanching times. 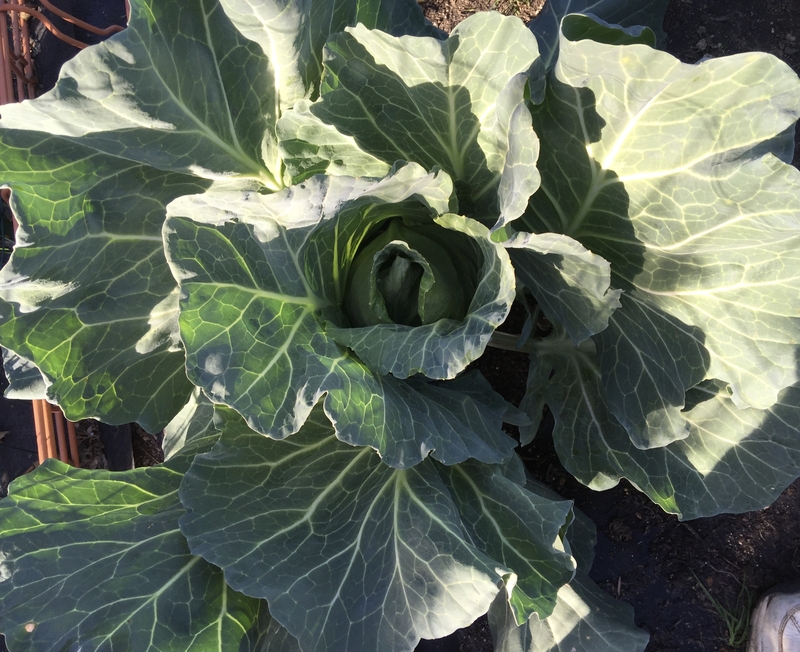 Blanching also helps clean the vegetable surface of dirt and organisms, brightens the color, wilts the vegetable for easier packing, and and retards the loss of vitamins. 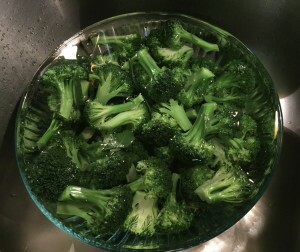 While we prepare the broccoli for freezing, we put a very large pot of water on the stove to boil. It is suggested to have at least a gallon of water boiling for each pound of vegetable to be blanched. We picked our broccoli in the garden, and have brought the heads into the kitchen to be prepared for freezing. First we stripped off the little leaves attached to the head and then cut the head into the size pieces we want to have on our plate when we eat dinner. 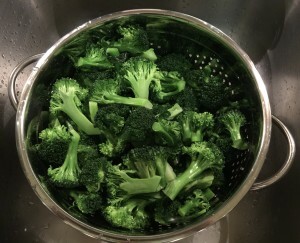 The blanching time for broccoli is 3 minutes. One small batch at at time, we add the broccoli into the boiling water and set the timer for 3 minutes. When 3 minutes is up, we dip the broccoli pieces out of the boiling water and place the pieces in an ice water bath or cold water bath. When all the broccoli is blanched and cooled, we drain the water away and wait a few minutes for it to drip dry. 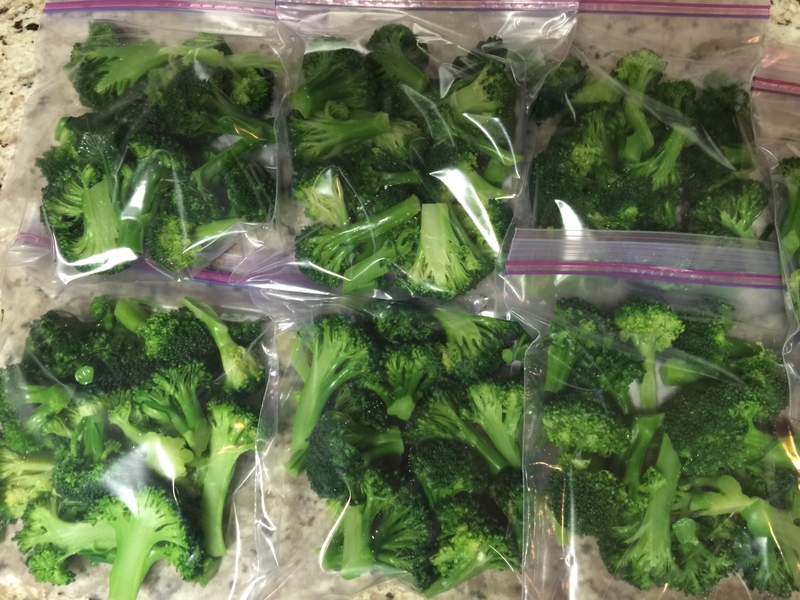 There are at least two ways to pack the broccoli, one is in small packs for individual meals and the other way is to do the individual quick frozen method. Today we are freezing individual meal packets. 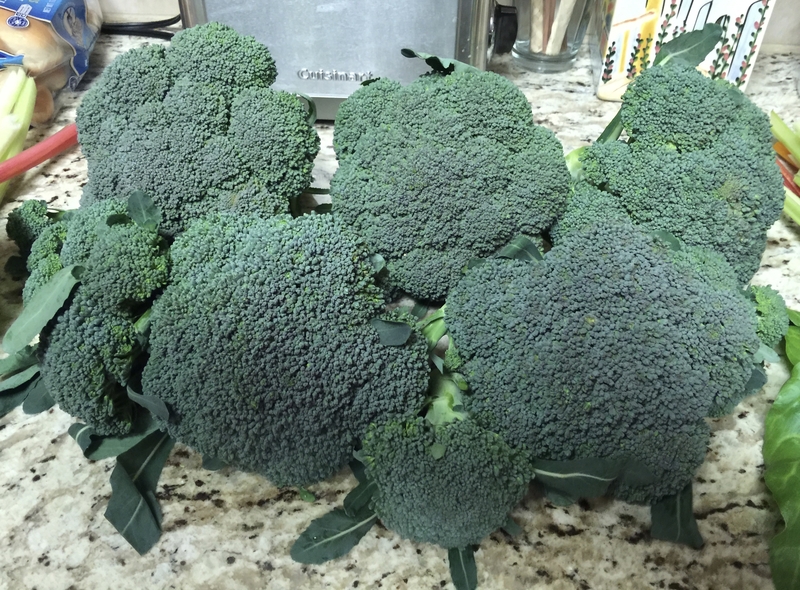 To individually quick freeze, spread out the individual broccoli florets on a cookie sheet and put them in the freezer until they are frozen solid. 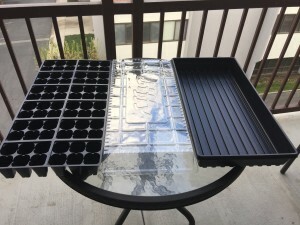 Then add the individual pieces to a large storage bag or plastic container to retrieve later. The pieces usually dislodge easily from the cookie sheet with a spatula. When bagged, place the broccoli bags in the freezer until they are needed. They will freeze more quickly if you do not put the packets on top of each other in the freezer.